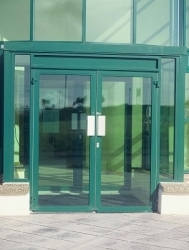 CDW Systems manufactures a range of aluminium doors for use in light to heavy commercial applications. We can supply doors fully fabricated and assembled with all hardware fitted, delivering these to your premises or direct to site, anywhere in the UK. Styles we offer include centre hung doors, anti finger trap doors, heavy duty sliding doors, automatic doors and our flagship Easysecure door. Easysecure is an evolution of the market leading Sapa Stormframe Easyway door, and has undergone developments to performance and security to offer maximum benefits to the end-user.